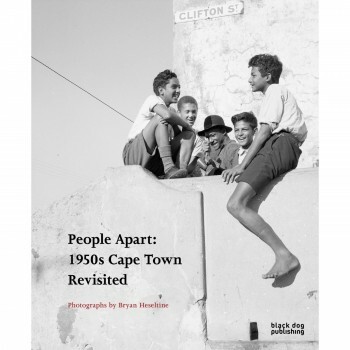 People Apart: 1950s Cape Town Revisited. Photographs by Bryan Heseltine offers a rich and fascinating insight into South Africa at the very beginning of the apartheid era through Bryan Heseltine’s previously unpublished photography of the early 1950s. In the late 1940s and early 1950s the South African-born, English-educated photographer Bryan Heseltine made a series of extraordinary photographs in and around Cape Town, a city in the midst of profound transformation following the rapid urbanisation of the post-war years and the election of the racist National Party government in 1948. Published for the first time in People Apart these photographs offer a rich and fascinating insight into South Africa at the very beginning of the apartheid era. Heseltine’s carefully composed images depict aspects of social and cultural life and illustrate the diversity of Cape Town’s inhabitants. The photographs are replete with historical, social and political implications; yet, at the same time, they transcend their status as documentary records of social conditions. The photographs evidence a respect for the subjects and their urban environment that ran counter to the ideology of apartheid; and Heseltine’s sensitive approach gave visual expression to the emerging anti-apartheid sentiments of the period. Through extensive biographical and socio-historical research, Darren Newbury situates Heseltine’s photography within its contemporary context, exploring the circumstances in which the images were made and first shown in South Africa, and their subsequent exhibition in London in the mid-1950s. He also asks what it means to look at the images now, in the post-apartheid era. Amanda Hopkinson contributes a substantial foreword on Heseltine’s photographs presented in the book. In addition, contributions from Sean Field and Vivian Bickford-Smith examine the relationship of the collection to oral history, memory and identity, and to other visual and written representations of Cape Town and its people. 112 plates and 49 colour and b/w illustrations. Published by Black Dog Publishing, March 2013.